The Red Stick International Festival is coming this Saturday to a library near you! If you live near the Main Library on Goodwood, anyway. Check out our previous blog post and LSU’s event page for more information. Included activities: Exhibits by Knock Knock Children’s Museum, NASA /Stennis, Arduino showcase/ local school art creations; Lego lab; Minecraft showcase and live lab; and an Interactive art project on Library windows, and more. Ages 6 and up, minors need parent or guardian present. Knock Knock Children’s Museum is partnering with LSU’s College of Human Sciences & Education, LSU College of Art & Design, and the LSU Center for Computation & Technology to transform the children’s storytelling rooms of the library into a playground of light, shadows and motion. Children will be delighted in using traditional materials to interact with light, color and images projected from digital devices. Elevator Projects is having a make-your-own Star Wars costume party and Galactic Photobooth – check out their Facebook post for more information! Venue provided by the East Baton Rouge Parish Library system. Electronic Arts – featuring playable demos of game, Acadian Robotics, the only 3D printer manufacturer in Louisiana, LSU’s Digital Media Arts & Engineering program and featuring digital and technology makers from around the area . Enjoy free tasty sno-cones and a camera drone demonstration in the plaza. Screening of STAR WARS – THE FORCE AWAKENS. 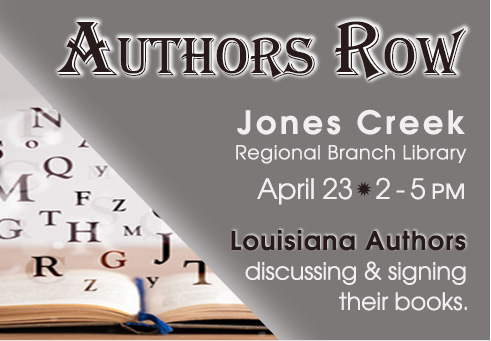 Come out to the Jones Creek Regional Branch this Saturday, April 23rd, to meet local Louisiana authors! Business and entrepreneurial titles from Monique Moliere Piper, David Walton Earle and Steve Kubicek. Tonia Askins will have Self-publishing Like a Pro to help you get your own book in print! Or you can learn from children’s author Brian Daigle How to Eat a Book! Terri Hoover Dunham will also be there with her Christmas tale The Legend of Papa Noel. Fun mysteries such as The First Case of Beers by M.LaRose, Louisiana-based political thrillers by Martha Gabour Manuel (great for people who’ve finished the One Book, One community read and want more! ), and serious true crime like Familiar Evil by Rannah Gray, based on the murder suicide of local TV celebrity Scott Rogers. Romance novels by Lynn Shurr, Shirley McCoy, and Anne Clayre Mason, and paranormal romance from Sharyn Schmitz. Inspirational works from Rev. S.M. Woods, Yvette D., Tremaine Sterling, and more. Last but not least, Emily Cogburn will be there to discuss Louisiana Saves the Library, a great Southern read for everyone who likes libraries and life in the South – and that’s all of us! These authors and more will all be there with books available for purchase and autograph, and will be happy to discuss their works with you. Don’t miss this fantastic annual event at the Jones Creek Regional Branch! Call Yvonne Hull at (225) 756-1180. Fridays only, the River Center Branch will experience a shift in hours to accommodate the spring season of the downtown Live After Five Concert Series. Check out the concert lineup to make sure you don’t miss this great local music tradition. It’s free! The Gale Virtual Reference Library has been refreshed and updated with Brand New Titles for Brand New Businesses – and education, and art, and more! We’re going to focus on business, though, because the closer we get to summer, the more our thoughts are turning to vacation possibilities, and two-week cruises through the Caribbean are not cheap. You can learn about everything from how to get and keep a job, how to get promoted, and how to make your money make you money. Nothing in this life gets a free ride; why should your bank account? But that’s a lot of books. And I mean, books are great, obviously; it’s just hard to speed-read one to get some quick tips on confident public speaking before a big meeting. Thank glob for advanced search functions! And there you go. Easy bite-sized results right at your fingertips, perfect for cramming in your eyeballs on short notice. 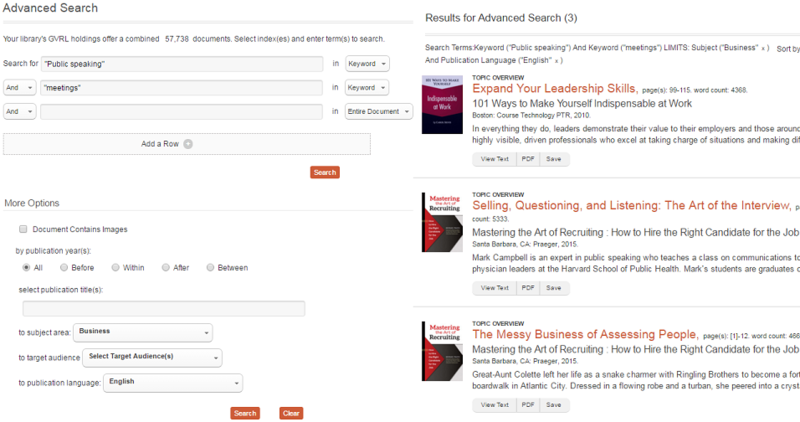 Check out the new titles in the Gale Virtual Reference Library today! 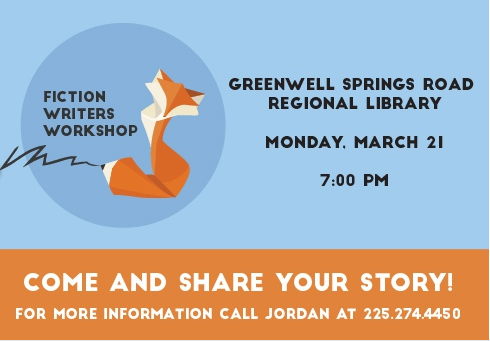 The Greenwell Springs Road branch is starting up a brand-new writers’ group. The next meeting will take place on Monday, March 21st, at 7:00 PM. If Greenwell Springs Road isn’t your branch, check the events calendar for more writing groups at branches near you! Are you interested in a career with the federal government right here in Louisiana? The federal government offers a variety of jobs, most with good pay and good benefits. Learn about local employment opportunities, careers, application procedures, and benefits of federal civil service. The seminar will be presented by Bill Tyler, a retired Administrative Officer of the Southern Regional Research Center, a federal agency based in New Orleans. MAIN LIBRARY AT GOODWOOD BLVD. This is an informational seminar, not a job fair! Registration is required. Please call (225) 231-3733 or register online. Hey, EBRP! We’re sorry to tell you that due to inclement weather, all branches of the library will close early this afternoon at 2:30 PM, and will be closed all day tomorrow. We’ll open again for regular hours on Saturday. Stay safe out there! 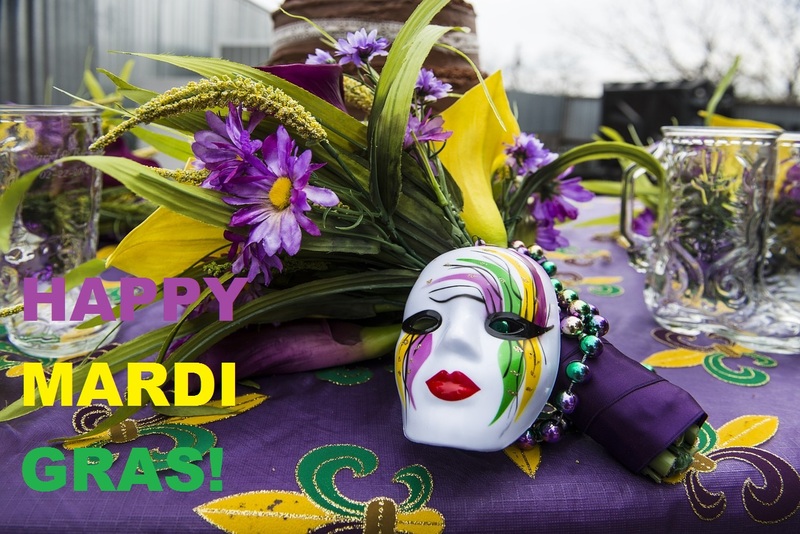 Have a great time at the parades, EBRPL! All branches are open today, but will close tomorrow (February 9th) in honor of the day itself. We’ll see you bright and early Wednesday morning! Posted on February 8, 2016 February 5, 2016 Categories UncategorizedLeave a comment on Mardi Gras! Look, we all know that the only inevitable things in this life are death and taxes. The library can neither confirm nor deny any rumors about the discovery of the location of the Fountain of Youth, but we can…drumroll please…tell you where to get help with your taxes! Yaaaaay! There’s no way to make that exciting. You know what’s exciting? Being audited by the IRS. No one said “exciting” was always good. 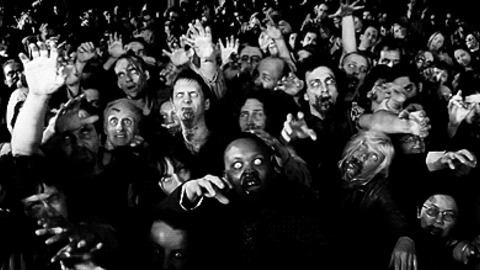 The zombie apocalypse, for example, would be very exciting, but not fun. Volunteers from AARP will be using library meeting spaces to provide free tax help to low- and middle-income taxpayers, especially senior citizens age 60 or older. Click the link below to find out when they’ll be set up at a library branch near you! We made the link a different color so it would be prettier. Taxes aren’t pretty on their own. This is not a program put on by the library, and trust us, you do not want librarians to help you with your taxes – we’re just letting you know where and when to find the people who can actually give you a hand with all this. Honestly, it’s like one step up from nonsense to most of us. We’ve got enough to deal with. We can, however, provide you with the basic federal 1040 tax forms starting later on in the year (whenever they send them to us), and we can help you print out state tax forms from the Louisiana Department of Revenue’s website! As long as you know what you’re looking for. We can’t stress enough how little we know about taxes, really. If you’ve got any specific questions about your federal taxes, call the local IRS office at (225) 343-8625 or check out their online resources. Good luck, everybody! Welcome to 2016! It’s going to be great. SO. Ready to get a fresh start? Lots of people want to start reading more when the new year rolls around – one of our book clubs can definitely help with that! We’ve got one for everything from true crime to historical fiction to global issues. You can find more information about them in our monthly newsletter, The Source! You can even start reading books in other languages with the help of one of our language programs, Mango, Muzzy, and Pronunciator (more info coming soon)! Want to learn more professional skills? Check out the Career Center, or our online resources like Lynda, Gale Courses, and Safari Techbooks! If you need a refresher on basic computer skills, just check out the computer class schedule on our website or call the branch nearest you for details. Whatever the new year brings you, remember – the library is always here to help. Happy New Year! Posted on January 4, 2016 January 7, 2016 Categories EBRPL Events, UncategorizedLeave a comment on Happy New Year!